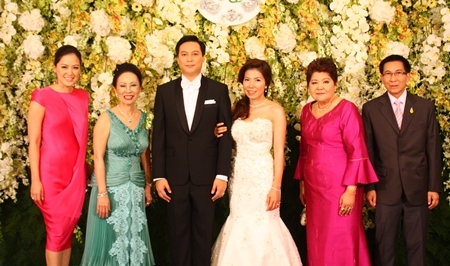 Representatives from Thailand’s Royal Family were on hand as the son of the owner of Pattaya’s Montien Hotel celebrated an April wedding. 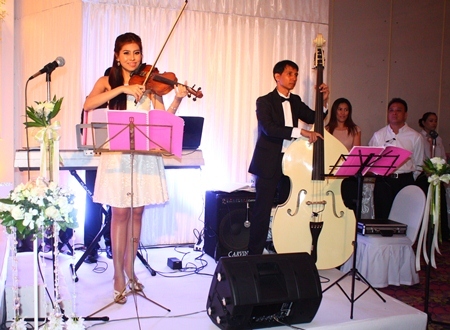 Phasu Snitwongse Na Ayutthaya married Nutnat Lertprasithchok April 5, but celebrated with a May 26 reception at the hotel’s ballroom. HRH Princess Soamsawalee designated Thanpuying Bhansawli Kittiyalarn to represent her at the ceremony. Relatives Mongkolchaleam Yugala Na Ayutthaya, Ticomporn Yugala Na Ayutthaya and Rajawongse Somlap Kittiyakorn arrived from around the kingdom, as well as politicians and friends of the bride and groom. 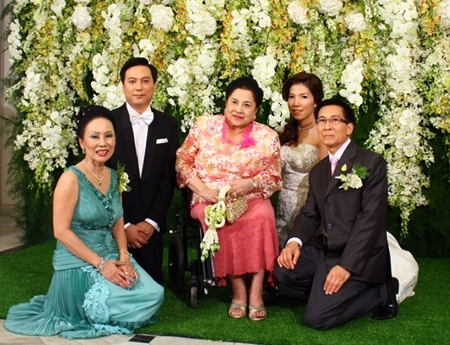 Thanpuying Bhansawli Kittiyakarn (center) blesses the newlywed couple and family (L to R) Achana Snitwongse Na Ayuthaya, Phasu Snitwongse Na Ayuthaya, Nutnat Lertprasitchok and Wachornsak Snitwongse Na Ayuthaya. 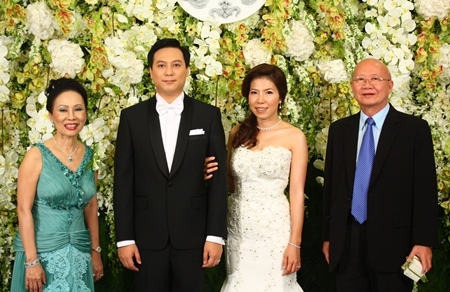 The couple had been friends and dated for 12 years prior to the wedding bells. Nutnat said she was impressed with Phasu’s sincerity, faithfulness, caring and his ability to apologize. 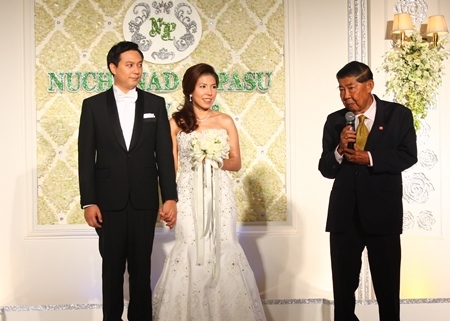 Phasu said he loves his bride’s caring attention and wisdom. 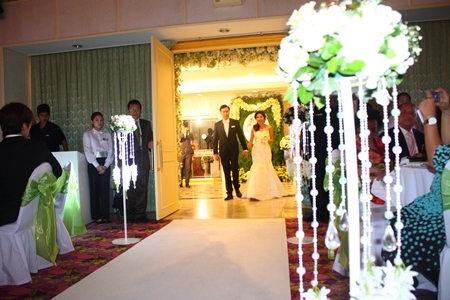 The couple was engaged March 2, with parents bearing witness. 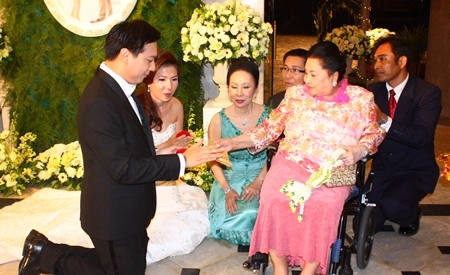 HRH Princess Soamsawalee performed the wedding ceremony a month later, pouring holy water for both the bride and groom amidst a delighted family. 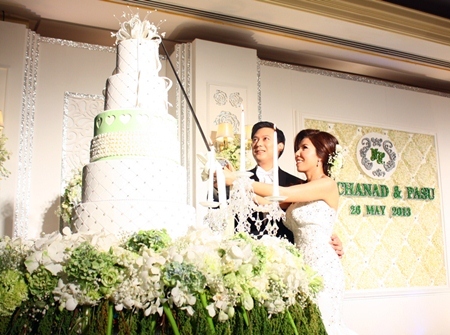 The newlywed bride and groom cut wedding cake.